While that was a less than satisfying response at the time, I later became thankful for my Mom’s calculator ban. I also began to see how the wisdom of her words spanned well beyond the boundaries of elementary school mathematics. While the introduction of computing devices to the general public may have began with calculators, it later expanded to home computers, networking, and eventually the Internet. This growth has continued to the point where these technologies are involved in every aspect of our lives. This has largely been to our immediate benefit. We can get many formerly tedious tasks done quickly and efficiently. We have both access to more information, and the ability to retrieve it faster than ever before. While the expanse of these new technologies has touched many aspects our lives, there haven’t really been many boundaries placed on their usage. Simple tasks, like figuring how much is $5 in euros, or determining how many cups there are in 38 ounces, would have been a quick hand calculation in the past. Now that type of everyday math has been replaced by phone apps and websites. A person moving to a new city, in the past may have tried to learn a map of their new hometown. Now, that same person is more likely to rely on their smartphone or a GPS device to get around. Given that we’ve off-loaded much of our learned tasks and knowledge to these new technologies, have they become crutches? Are we missing out on unintended, yet still critical learning experiences? The answer to this question is particularly important for the Christian Church. Douglas Rushkoff, in his book “Present Shock” discusses the socio-cultural impact of the digital age on society. Among his observations, he asserts that the pervasive nature of technology has led to the collapse of the linear narrative (aka story-tellin) throughout society. The concept of things having a beginning, middle, and a resolution has been a fundamental part of how we view life for millennia. Beyond being the structure of every sitcom you’ve watched and every story you were told as a child, almost every system of belief, both secular and religious, is based on the linear narrative. The Bible, for example, begins with creation and ends with Christ’s return. Rushkoff asserts that these narratives only work when the listener is held captive by the storyteller. The system works when the listener has no alternative but to follow the story to its end. Technology however, provides so many other options and counter-narratives, it is impossible to get listeners to stick around for, or invest in a single story. Time will tell if Rushkoff is right or not, but the critical nature of story, continuity, and context is a key element of correct interpretation and understanding of The Bible. Knowing that Isaiah came before Mark and the relationship between the two books is critical to grasping Christianity. 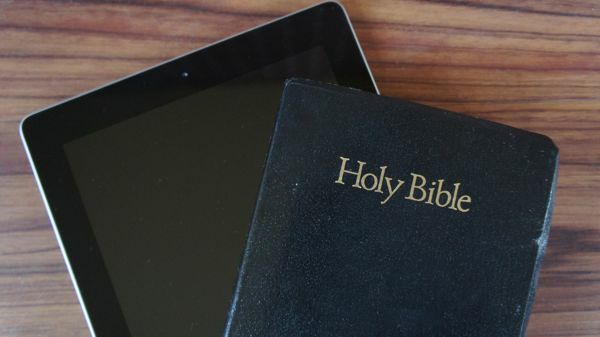 Making the Bible indexable and searchable, as most Bible apps and web tools do, allows the user to quickly and efficiently get to any part of Scripture. It also has the unintended consequence of flattening the book’s content. The relationship between Genesis and Ephesians is obscured. The name of these books and the order in which they appear are reduced to tags, or elements of a database query. In contrast, a person flipping through a physical Bible looking for Matthew 25 would also gain additional, unintended insight. They would learn that the Bible is divided into an Old and New Testament. They would see that Genesis chronologically comes before Ephesians. They would see that Isaiah comes before Mark. These basic lessons are the critical first steps in learning the fundamentals of the faith. They are obscured when a person’s exposure to the Bible is limited to digital sources. While these tools may be helpful in the hands of an experienced Sunday School Teacher, or a mature Christian, who keeps them out of the hands of young believers who still learning the fundamentals of the faith? How does the Church make sure technology is an aide for its members and not a crutch? Have you ever gone grocery shopping when you’re hungry? While that is typical rookie mistake for the uninitiated, I still slip up and do it once and awhile. More than once, I’ve come home with more food than I originally planned (typically food of the dessert variety) because I went to the store on an empty stomach. People can make bad decisions when they put more emphasis on satisfying the needs of the moment, instead of considering the larger implications of our actions. Jacob’s demand, in addition to seeming a bit out of place, was also way out of proportion to Esau’s request. A birthright was the material inheritance handed down to sons by their parents. This inheritance would be divided among the sons, with the eldest son receiving a double portion. That’s a lot to ask for a bowl of stew. What was Esau’s response? 32 “Look, I am about to die,” Esau said. “What good is the birthright to me?” 33 But Jacob said, “Swear to me first.” So he swore an oath to him, selling his birthright to Jacob. Esau, racked with hunger and apparently not focused on the big picture, signs away his birthright to his brother. Many years later, Jacob received not only his brother’s inheritance, but the paternal blessing of his father Issac, after another bit of trickery (Genesis 27). This blessing is also typically reserved for the eldest son. In the end, Esau does serve Jacob, and Jacob goes on to become the father of the twelve tribes of Israel. Based on a momentary desire, Esau gave away something of great value for something of little value. Instead of recognizing Jacob’s outrageous request for what it was and demanding new terms (BTW – Why didn’t Esau just get his own stew? ), he accepted the offer – a choice he later regretted. Just because Esau didn’t treat his birthright with care didn’t mean that it wasn’t worth caring for. While it may be very easy for us to dismiss Esau as a bonehead, we should all consider the lesson this story illustrates and try to apply it to our own lives. In fact, I would assert that most of us exhibit an Esauian level of bone-headedness on a regular basis. And just as with Esau, the time may come when this behavior may be something we regret. Anyone who has signed up for a new cloud service, bought a new phone app, or loaded new software on a computer is familiar with the installation ritual. We download the app, click on an icon, and the software install program asks us some basic set-up questions. At this point, we are eager to have our new app or game up and running so it can change our lives (if only for a moment or two). Right before we can get to our anxiously awaited app/web service/software, we are confronted with – “IT”. You know what “IT” is. It’s black, white, and covered with tiny print. It also requires prodigious amounts of scrolling to get through. It’s the Terms of Service agreement (TOS). Every software company uses these TOS agreements to define the rights you have (and give up) when it comes to your use of their product. The relationship the software company has with you, the software you purchased, and your data, is defined in this document. TOSs are lengthy, and like most legal documents, are hard for the average person to understand. They also tend to be written with a bias in favor of the author. The terms and conditions described in these documents range from the reasonable, such as not making illegal copies of the software, to the outrageous, such as signing over your immortal soul. These documents are written to give the company as many rights as possible. TOS agreements are also legally binding. Knowing this I, like most people, simply click the “OK” button in order to get to my bowl of stew. We sign away an unknown number of rights to get to the fun part. We do it to get to a new app, or to get access to the social network that all of our friends are on. Sometimes, we are pressured to click OK because we need this software for our jobs. Other times, we click OK in order to get a service we want for free (like email or office-type apps). Most of the time we click OK because it’s just easier to do that than to take the time to figure out what all that crap means. We let the real (or more often, self-imposed) need in the moment push us into make choices that we may regret in the future. Choices that result in us giving up our rights to the things we create, and our right to privacy. Like Esau, we do have alternatives. We could seek out open-source software alternatives. We could reject apps that don’t respect our privacy. We could even choosing to PAY (!) for some web services on the condition that our data STAYS ours. Unfortunately, most of us simply click “OK” and take the easy way out. The good news is that we all don’t have to wind up like Esau. There are helpful online resources available, like the Electronic Frontier Foundation’s TOSBack 2 mailing list, which tracks the changes in the TOS agreements for some of the most popular web services and notifies you when they change. There’s also a website called Terms of Service – Didn’t Read (http://tosdr.org/) which acts as review site for the TOS agreements of major software or web tools. They explain these agreements in layman’s terms, and grade each on their scale of acceptability. Use these tools and support these organizations. And don’t be like Esau. Your information IS valuable. Treat it that way. I very recently watched the documentary film “Transcendent Man”, which is loosely covers the life and beliefs of famous inventor, author and technologist Ray Kurzweil. Kurzweil has been on numerous talk shows and news programs to discuss his vision of the future and where technology is headed. The film is a mix of interviews with Kurzweil, where he gives his thoughts about how technological advances in the next 7-10 years will change how we think, how we learn, how we live, even how we die. In the near future, according to Kurzweil, human will be able to upgrade their ability to learn and remember things as simple as upgrading a computer. Physical illness will be overcome through microscopic robots who will flow in our bloodstreams, fixing our bodies from the inside out. When (or if?) our physical bodies wear out, our consciousness will simply be uploaded to a waiting synthetic host form. We will literally be able to live forever. The film also includes interviews with people who both agree and disagree with Kurzweil’s vision of the future. One of his proponents, Peter Diamandis, TED presenter, noted visionary, and founder of the X Prize Foundation, goes a step further. Diamandis says, “We will become god-like – I know people don’t like to hear that…”. Kurzweil even hints at a similar belief at the end of the film. After describing the exponential expansion of mankind’s knowledge that will occur after the Singularity, Kurzweil ends the film by saying, “So does God exist? No, not yet…”. Kind of makes you look at Genesis 11 in a new light, doesn’t it? Kurzweil’s statements are in line with transhumanism, which is the belief that humans can/should be augmented with technology to the point where we eventually supersede our organic bodies. While that may seem like far-off crazy talk to some, the questions transhumanism tries to answer are real. And we will need answers for them faster than we think. Brain-controlled robotic limbs, data recording implants, and drug-delivering robots that live in your eye are already a reality. I also think its fair to say that within the past 5-7 years, the trajectory of technology development has been increasingly the direction of integrating technology closer and closer to our physical bodies. Google Glasses is a prime example of that. Wearable computing is considered by many to be the next major step in technology after the smartphone. It’s not that big a step from wearable computers to computer implants. There is no question that technology will eventually give us the ability to greatly augment our human bodies beyond their original design. This movement however, raises several important questions. While technology may eventually be able to increase our ability to think, learn, and remember, it won’t be able to change our irrational elements, like jealousy, insecurity, and pride. These are key parts of what makes us human (and less that God). If we are given God-like abilities in one aspect, but still have human fallibility in another, we may be setting ourselves up for trouble. I liken it to a six-year old boy with a chainsaw. While he may be strong enough to pick it up and start it, and smart enough to see how cool it is, it’s likely that either he or someone around him is going to get hurt if he starts using it. I once read an article in a car magazine about a car enthusiast (polite speak for car nut), who put the huge V8 engine from a Mustang GT into a tiny Mazda Miata. To give you an idea of how tough this is, the engine from the Mustang is more than twice the size of the standard Miata engine. This is a modification of epic proportions. Once the retrofit was done, the reviewers of this car magazine drove the car and gave their thoughts. Each reviewer loved the straight-line speed of the jacked-up Miata. It blew everything off the road. Smiles were wide on everyone who sat in the driver’s seat. But the reviewers also made some other observations. In order to make the large engine fit, the mechanics had to remove much of the firewall insulation separating the engine from the passenger compartment. That meant the floorboards on the inside of the car stayed extremely hot. The heavier engine in the front of the car also meant that the Miata was wildly out of balance. This made handling the car through turns nearly impossible. While the Miata with the powerful Mustang engine was incredibly fast, the rest of it’s design was not capable of handling what came along with so much power. Miatas are designed to be sprightly and quick. Miatas are meant to fun to drive on twisty roads. Mustangs are high output track stars, whose virtues are proven in 0-60 sprints and ¼ mile times. The two vehicles are designed to with two different purposes in mind. By stuffing a Mustang V8 into it, the Miata could no longer fulfill the purpose it was originally designed for. In a similar fashion, augmenting human capabilities with computerized implants (to the level suggested by transhumanists) may result in the same problem. New beings that are too powerful to be human, but not capable of being the “gods” envisioned by the inventors of these technologies. Regardless of our level preparedness for their arrival, these implant technologies are being developed right now. How do you think we should use these new products? Are you a transhumanist? Tech blog The Verge posted this article yesterday regarding the FAA’s Public Engagement Sessions concerning the use of drones (or to use their term – Unmanned Aerial Systems) inside the US. The purpose of this session was to get feedback from the public at large regarding the use of UAS’s within the borders of the United States. What did “We the People” have to say? Opinions ranged from the highly pessimistic “this is the end of privacy in America”, to the (mistaken) assertion that owning a drone is a constitutional right protected by the Second Amendment. More disconcerting was the fact that these FAA public meetings seemed to take place with little advanced notice. Additionally, it is unclear how the public’s feedback will in any be taken into account as they work to create regulations around drone use in the US. Going back to the question mentioned in last week post on this topic, I am left with the same theological question – what will be the impact on our leaders who will be equipped with this level of detailed information about the people they serve? The ability to essentially be where any other person is – instantly, is extremely powerful. The temptation to abuse such overwhelming control over others seems like it would be exceptionally hard for any person to resist. (BTW – the post doesn’t mention any of the potential checks and balances that would be in place limiting the use of drones on US citizens). Are new technologies (like drones, pervasive data collection, etc.) pushing the boundaries of humanity’s ability to handle them properly without abusing them? Another one of common theme from last month’s SxSW Festival was the self-driving car – specifically the work Google is doing. There seems to be a large amount of pent-up anticipation in the geek community for an automobile that will take it’s passengers from here to there with the least amount of human intervention possible. One of the primary arguments I’ve heard for this technology is “Think of all the other things you can do with that time! You can answer emails, keep in touch with friends on Facebook, follow the news on Twitter…”. Now as I mentioned before, I’m a person who likes cars and enjoys driving, so this concept is a bit foreign to me. There was a time when driving was an activity meant to be enjoyed in and of itself. Things like mobile phones were a distraction from that activity. But as technology has advanced, and as we now have placed increased importance on what takes place online, the priorities have reversed. The connection to the online world, or the Data Feed, is now the primary activity, and driving (for many) is the distraction. 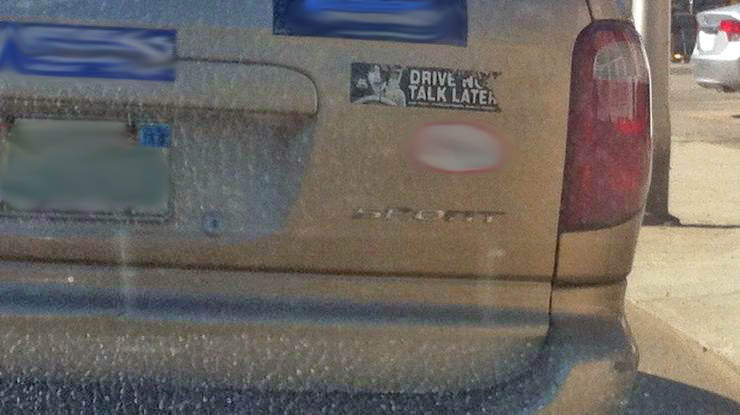 This is exemplified by the large numbers of people who either talk on the phone (sans a hands-free device) or text while driving. This is despite the nearly universal acceptance of the fact that this is dangerous behavior. And it is not only driving that is an annoyance blocking us from our latest tweet or email. About a week ago, there was a report from several news outlets saying that the FAA was considering lifting it’s ban on the use of certain electronics during take-off and landing on commercial flights. The current policy is extremely unpopular with travelers, who have found the 10-20 minutes of disconnection from their data feed during takeoff too much to bear. A large percentage of commercial flights are equipped with wifi, so passenger can re-connect to the Internet as soon as the flight reaches altitude. The question for up for discussion in this post is why has uninterrupted connection to the data feed become so critical? Why is it so important that we maintain this data line to the outside world, to the point we are willing to put our lives (and the lives of others) at risk? In his book “Present Shock: When Everything Happens Now”, media theorist Doug Rushkoff proposes an answer to this question. He believes that our need to constantly be connected is a futile quest for “digital omnipotence” – a desire to be all-knowing, via our devices. He claims this is futile because the best thing all of our gadgets can provide is a report of “what just happened” as opposed to reporting what’s happening in the moment. This is due to both the communication delay inherent in our technologies and our brain’s limited ability to process information. While his position may seem extreme at first, a quick review of the history of mobile communications tends to support his point. The first step on the mobile communications ladder was the pager. The pager was a simple device that, while not allowing you to directly communicate with a person, would tell you someone was trying to contact you. The user could then get to the nearest phone and call the number on the pager’s display. This was followed by the simple cellular telephone, which allowed us to speak directly with others whenever we wanted, wherever we were. This ability to reach someone, however, was limited to instances when both individuals were in an atmosphere where they could speak freely (for example, a meeting with your boss isn’t the best time to take a call from a recruiter about a new position). We needed phones capable of letting us communicate with others in circumstances when verbal communication wasn’t possible. This led to phones capable of messaging and email. With the arrival of these phones, terms such as “crackberry” (a reference to the addictive behavior exhibited by users of Blackberry messaging phones) entered our lexicon. Having found a way to give ourselves constant access to individuals, the next logical step was to find a way to gain constant access to information. To address that need, the smartphone was born. Its ability to provide full Internet access, as well as specialized apps, can keep us awash in a constant stream of information (as long as there’s signal). The progression from 2.5G to 3 & 4G, to LTE wireless data networks was all an effort to get more data to us faster. What’s the next step in our telecom evolution? It very well may be wearable computing, such as the much-publicized Google Glass. Google Glass is a device which mounts to a user’s eyeglasses, and places a small, transparent display in the user’s field of vision. This display will be able to both keep the wearer informed with the latest updates from his or her data feed, as well as provide information about the users immediate surroundings (via a small, outward-facing camera). Each step in the evolution of these devices has been an attempt to bring the data closer to the user – to minimize the time it takes for us to digest the data coming in. With each attempt at minimizing this time, we get tantalizingly closer to knowing whatever we want to know, the instant we want to know it. So is Rushkoff right? Is this desire for a constant flow of data, delivered at ever-faster speeds, ultimately a desire to be omnipotent? To be like God? Or are we simply reading too much into our desire to be more productive?